Winter is coming, which means colder weather is on the way. You can be prepared with a new fireplace to keep your home cozy and warm during the winter months. 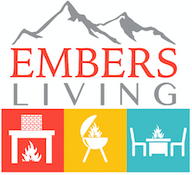 Embers Living has a variety of wood fireplaces for sale from a number of brands include Napoleon, Vermont Castings, Osburn and more. The fireplaces we carry come with elegant designs to enhance your home and various sizing to be the perfect fit for your household. Take a look at our selection and make your purchase with us online today!